The 8th of March mobilizes to fight against all structures that discriminate against and oppress women*, lesbians, interpersonal and trans people as well as people with an open gender identity. The successes in many countries are reflected in the enshrined legal equality of women* and men*, in equal educational opportunities and in the improved social status of women*. Patriarchy is far from over. Most women* are still responsible for education, care and housework, even if they are gainfully employed. They are often employed in service or part-time jobs. We demand: Stop the double exploitation! 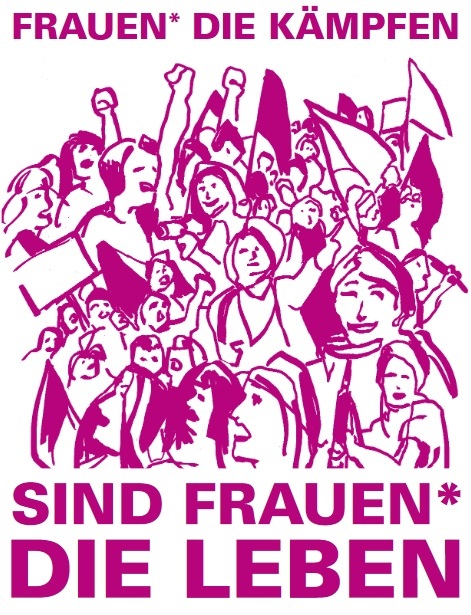 For freedom and self-determination and against war and oppression through sexism and violence. Women * fight internationally ... for recognition, appreciation and self-determination! We fight for the self-determination of our body and oppose §218 and §219 that make the termination of pregnancy in principle a punishable offense. ... against violence, abuse and everyday sexism! Worldwide, sexual and domestic violence is on the agenda. Often the victims are blamed for complicity. Due to religious or patriarchal beliefs, many women* on earth suffer from painful genital mutilation. ... against fascist and religious fundamentalist regimes and parties! For example, the women* of the self-defense units in northern Syria dedicate their lives to the fight against Daesh respectively IS. They also defy military aggression by the Turkish military. Meanwhile, they have managed to build an international grassroots and anti-sexist movement. Even women* fleeing from war or environmental disasters become victims of sexual violence. We demand the recognition of women* specific reasons for escape and are against deportations. Refugees must be able to live in dignity and shelters must be set up. We want people to be the center of attention, not exploitation and greed for profit. Together we want to fight for the liberation of patriarchal structures and mechanisms of repression. Therefore let's go on streets - joint on 8th of March!